Not to be dramatic, but the search is over. 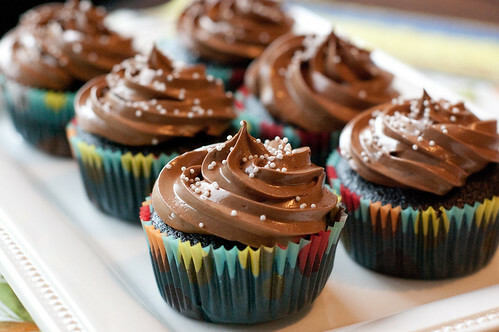 These are quite possibly the most perfect cupcakes ever. Leave it to Cook's Illustrated to take something as simple as a chocolate cupcake and turn it into a mind-blowing dessert. A chocoholic's dream, these cupcakes hit you with chocolate from 3 sides: a moist, rich cake, smooth ganache filling, and a silky and buttery frosting. Seriously, these aren't for the faint of heart. But for someone like me, who could easily subsist off of chocolate, they are perfect. For the ganache filling, place chocolate, cream, and confectioners' sugar in a small microwave-safe bowl. Cook on high power until mixture is warm to the touch, 20-30 seconds. Whisk until smooth, and transfer to the refrigerator. Let stand until just chilled, no longer than 30 minutes. Place chocolate and cocoa in a medium bowl, and pour hot coffee over the mixture. Whisk until smooth, and transfer to the refrigerator to cool completely, 20-30 minutes. Once all the butter as been added, pour in the cooled chocolate and vanilla. Mix until well combined. Increase speed to medium-high and until light and fluffy, another 30 seconds to a minute. I just saw these in the latest CI issue and have been dying to make them. Glad they're every bit as delicious as they made them out to be! I love CI - I have this on my list to make too - yours look perfect! These look yummy! Does CI explain why they use bread flour? this cup cake look so beautiful and it must be taste very good too! Beautiful! And sound so indulgent and delicious. Great minds think alike! 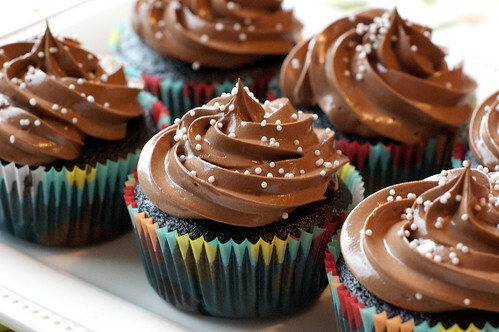 I just made a chocolate overload cake that reminds me of these cupcakes. Your cupcakes look BEAUTIFUL! I love your frosting skills! goodness gracious these look fabulous! These look stunning! I bet they are quite delicious! Oh my gosh, these look and sound amazing! I'm going to have to try these this weekend. Thanks for sharing the recipe! Okay. You've talked me into it. I'm willing to come over and eat a plate full of them for the sake of historical documentation. I'm just unselfish and willing to sacrifice like that. Wow, these do look perfect! I'm very tempted to do a comparison post with these and the ones that Annie just posted. Bridget, I think that's a fantastic idea! Hi! I just made these and for some reason the frosting is just not setting up. Is there anything I can do to change that? Thanks! I'm not sure, as I wasn't there to watch you make them, but the biggest mistakes in making swiss meringue are adding the butter before the meringue is cool enough, or either over or under-beating the meringue. So sorry you had problems! Mine wasn't as thick as traditional buttercream, but it still piped beautifully! Those do look like amazing cupcakes! And I can never get enough chocolate! Hi Haley, In a pinch I've used the Hershey's "Special Dark," but I think I've found Dutch Processed cocoa at Whole Foods and/or Fresh Market. I tried this recipe and it worked brilliantly. But will there be any adverse effects if I don't use the coffee the second time around? Anonymous, I don't know that I'd say "adverse" effects, but coffee does intensify the chocolate flavor, so they just wouldn't be quite as chocolatey. I'm glad you enjoyed them!! I made these, and they were wonderful. Not your average crappy duncan hines....These are impressive! Just wondering, do you think this would be okay to make as a cake instead of cupcakes? I'm thinking of using this recipe for a cake and either use the ganache in between the layers or make a chocolate mousse for the middle layer instead. Thoughts? Absolutely the best chocolate cupcakes I've ever eaten!!!! Thank you so much for sharing this recipe. It definitely is the best cupcake recipe and I topped it with rose buttercream instead (have written a post if you would like to see) and I also used it for a layer cake as well. Absolutely devine.